To order, call (800) 935-9507 or fill out our contact form. The HP DesignJet 500 plotter delivers clear, crisp images with rich and uncompromising image quality. This plotter delivers Hewlett Packard quality which has been the reason that the 500 series has been the best selling plotter for several years. The versatile paper handling capabilities let you choose between roll and sheet-fed paper of many different types (such as inkjet paper, heavyweight paper, coated paper, Tyvek, film, and many more. 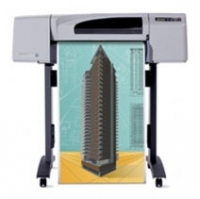 The Hewlett Packard DesignJet 500 is the perfect choice for graphics and technical professionals who want an all-purpose plotter that is smart, durable, and reasonably priced for their personal office or small to medium sized workgroup. © 2019 Manesh Electronics Inc. Page last updated: January 9, 2019. Code by Brundage Web Design.